Goal Kickers –Johnson 5, Shea 3, Ford 2, Manteit, Murdoch, Clements, Clark, Boston, Turner. Best Players –Boston, Shaw, Johnson, Murdoch, Roos, Shea, Clark. 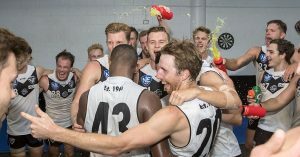 The Southport Sharks have begun their title defence with a grinding 62 point win over the Redland Bombers at Fankhauser Reserve. Comeback kid Charlie Ford opened the scoring with a soccer goal but Jordan Taylor’s courageous marking set the tone for the day. Co-Captain Andrew Boston was copping a heavy tag but when Jed Turner was gifted a goal by the umpires, we led by 18 points at the first break. Johnson and Manteit both goaled early in the second term before a huge collision between Tom Miller and Jordan Taylor saw the latter leave the field with blood streaming from a head gash. Johnson goaled again but Redland were refusing to lie down. Both sides traded goals early in the third and the margin was only 14 points half way through the term, but a brilliant goal from Boston on his left, followed by Charlie Ford’s second courtesy of a Jack O’Shea tackle, the lead then stretched to 41 points after a classy Jamison Shea banana goal. Rhys Clark landed a long bomb early in the last quarter and the Ladies Day specialist Mitch Johnson added two more goals as the lead eventually blew out to 62 points. Image via TJ Yelds, NEAFL. Watch all the action LIVE via NEAFL TV.